Tuna salad has its detractors, but we are not among those people. On crackers, in a tuna melt, stuffed in a pita, right out of the bowl—we’re on board. We’ve noticed, though, that everybody seems to have their own personal take on this classic salad. We wondered if there was a way to kick up our tuna salad to the next level. So we asked around among our staff and some chefs to get some new tuna salad inspiration. Toasted Texas pecans! Adding toasted pecans as a textural component will elevate a good tuna salad to a great one. My best advice for tuna salad is less is more. It starts with buying good tuna. Can be fresh, frozen, even canned, as long as you would eat it as-is and still enjoy it, it will make a great base for tuna salad. I also recommend not over-mixing; if it’s stirred up too much, the fish falls apart and you’re left with fish mush. I also like to add some crunchy stuff like raw celery, Chow Chow (it’s essentially pickled corn, an ingredient we make at Anker, it also add some nice acidity to the dish), and top it off with crushed up potato chips. I think everyone’s tuna salad is as individual as thumbprints: My mom, for example, favored hard-boiled eggs and chopped dill pickles. 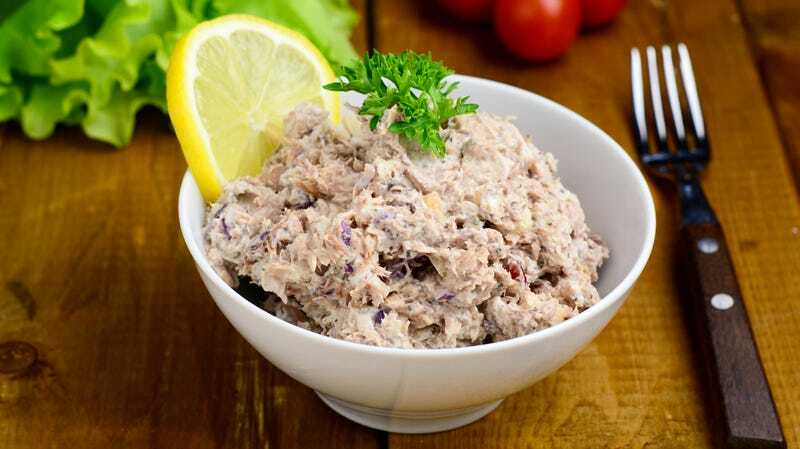 Once when I was a kid at a neighbors I exclaimed how much I loved tuna salad, and received the worst bowl of it I’ve ever eaten: just low-grade tuna and Miracle Whip (shudder). Carrying over from when my kids were little, I still favor the non-crunchy kind: jarred pickle relish and lots of lemon pepper. But now that the kids are a bit older, I’m now expanding my tuna salad, which is such a staple I’ve taken to buying cases of Bumble Bee White Albacore at Costco. Some days, I may want lime juice and capers. Another, more lemon and avocados. But an advantageous recent add happened when I ran out of pickle relish and had a giardiniera relish left over from another recipe. The perfect amount of dill and heat made for my favorite tuna addition yet. I mix in chopped green apple, chopped celery, mayo, salt, and pepper into the tuna salad. The apple gives the tuna a fresh bite—then I like to stuff the salad in half a red pepper and eat it with a fork and knife. My biggest tip to improving tuna salad is: Use better tuna. I love Ortiz Bonito Del Norte. I add in a little bit of mayo, lemon juice, lemon zest, Calabrian chili paste, olive oil, finely chopped celery, and lots of herbs (parsley, dill, and basil) to give it more flavor. Try seasoning it like a Thai salad and turn it into a fun play on Thai Larb. Season tuna with chili flakes and a pinch of sugar. Finish to taste with lime juice and fish sauce. Top that with some cilantro, sliced green onion, and mint leaves. Eat wrapped in Bibb or iceberg lettuce leaves or with thick slices of cucumber. Definitely lots of raw onion (scallion or red onion), Calabrian Chilies or sriracha for heat, celery and celery salt, kewpie mayo for a little sweetness. A good amount of acid (lemon) and a handful of chopped herbs (celery leaf, chervil, chives, parsley) at the end, as well. Even as a mayo fan, I’m sometimes slightly freaked out by how much mayo I need to add to the tuna to make it not-dry. I’ve started subbing half Dijon mustard instead of all-mayo, and it’s delicious—spicy and vaguely French, but not too far off from the classic. A lot of folks I know like adding lemon juice to their tuna salad, but we bring the acidic element from a different place. Our family would always take out pickles from the fridge and pour a few splashes of brine straight from the jar and into our tuna salad mixture. Not only does it add the requisite tang, but there’s salt and dill flavors too. how do you take these? What should you throw on a grill besides meat?